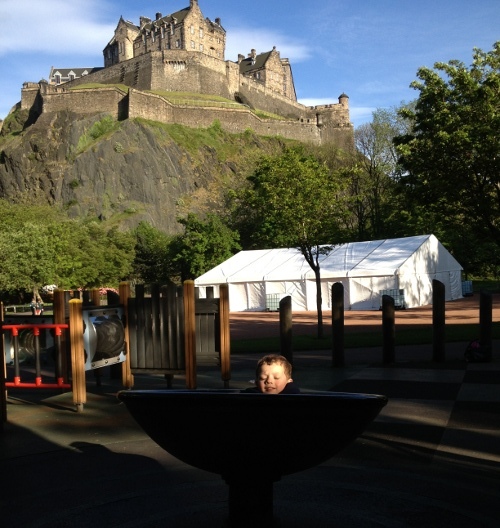 The absolute best playground we visited in Scotland was on day two at the Princes Street Gardens in Edinburgh. 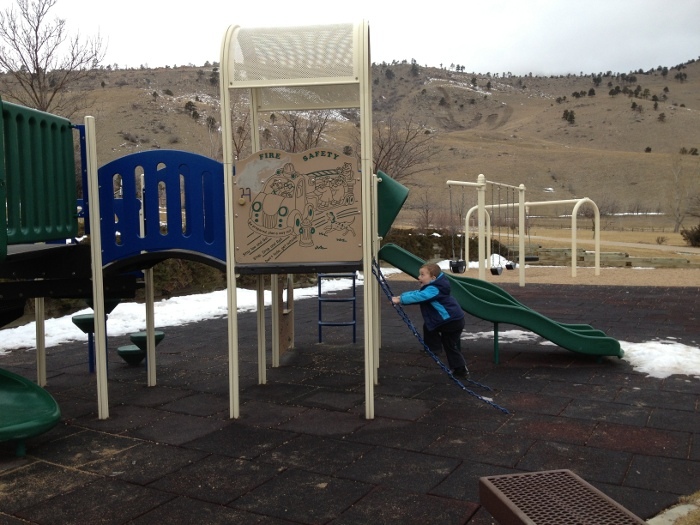 The playground is located on the far western side of the park. The park map we saw neglected to mention there was a playground and we trudged the entire length of the park, Calvin complaining the entire time, on faith having heard a rumor there was suppose to be a playground somewhere. I was very relieved when we found the park to see it was worth the trek. The park is spectacular. 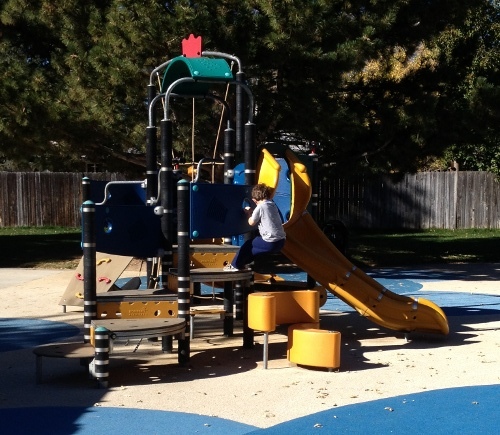 The main playground equipment is setup like a play castle. 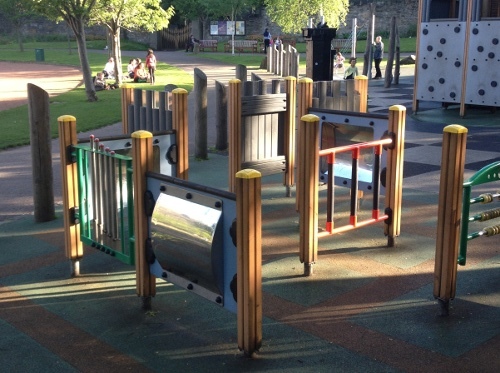 It has all the normal playground features such as slides, monkey rings, rope bridges, etc. There’s also a climbing wall so you can storm the castle. 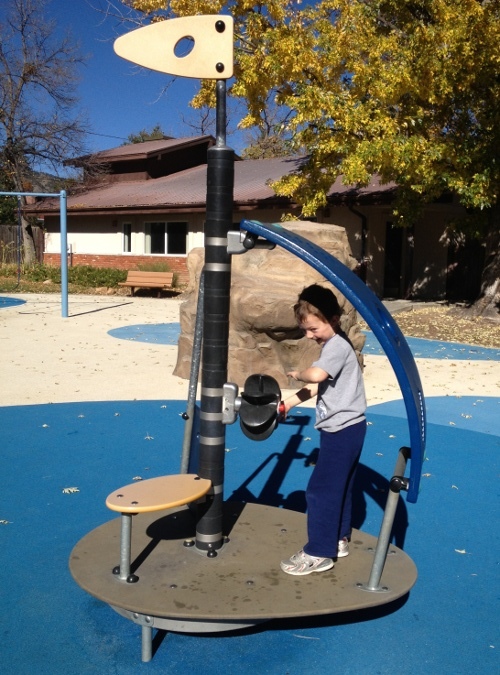 The playground also had a wide variety of spinners ranging from single-person spinners to a giant rope climbing apparatus that also spun. There’s also a little kids area and the obligatory themed spring rider. And, of course, a log swing that looks like it could be used to ram open (fragile) castle gates. Picnic area Can’t remember but the park itself has a ton of benches. A bit tricky to find if you don’t know where it is. 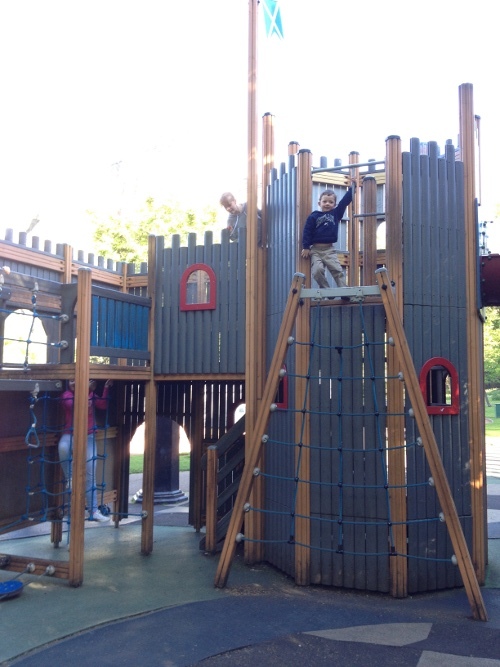 This entry was posted in Calvin, Parks and Playgrounds, Scotland 2014 on October 25, 2014 by kiesa. 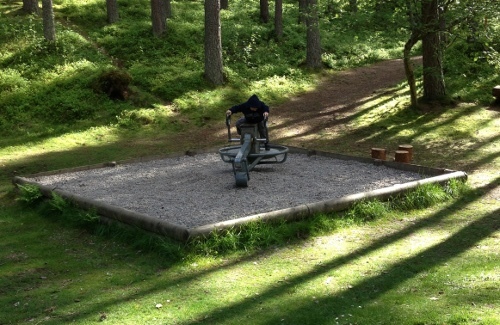 I’ve been meaning to post pictures of the Scottish playgrounds we visited but kept procrastinating. 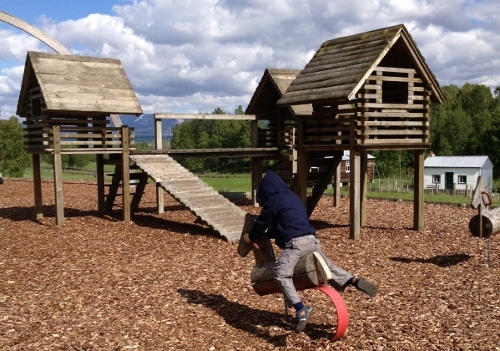 While Scotland isn’t quite as overflowing with playgrounds as Hong Kong is, we visit several nice ones. On our seventh day in Scotland we visited the Highland Folk Museum. We arrived toward the end of the day so didn’t have nearly enough time to wander around. However, right within the entrance is a pretty nice playground area for kids. 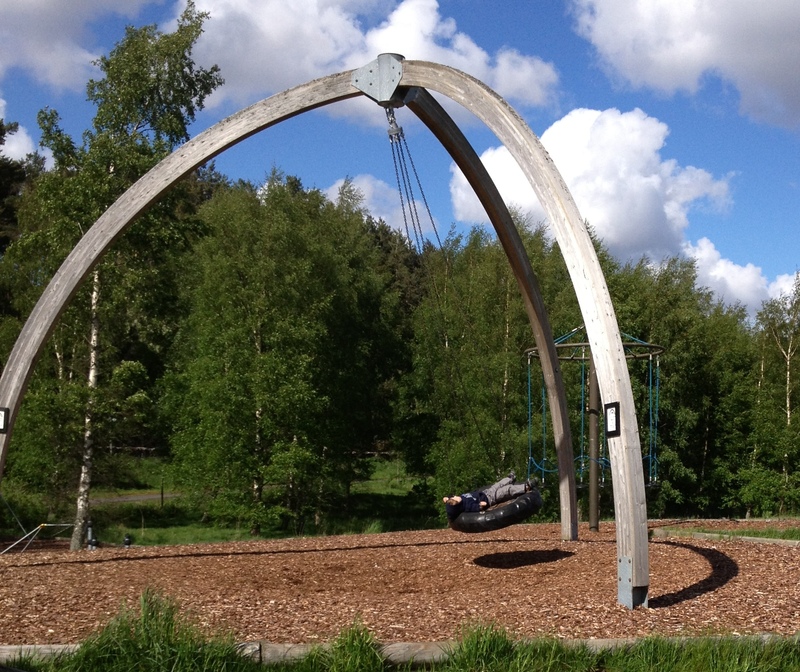 Among other things, they have the best tire swing I have ever seen. It’s huge. 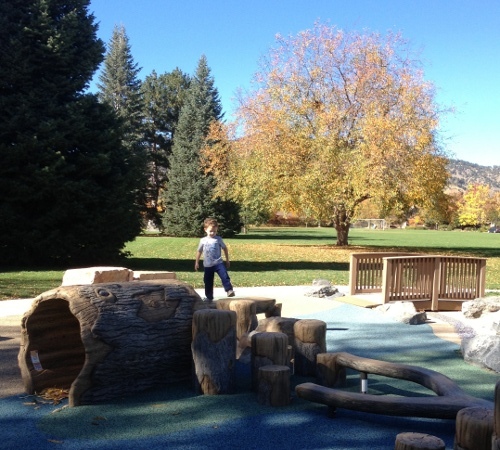 The main playground area had a rustic feel to it. They also had a fantastic spinner. I think it would have been even better with more people on it. 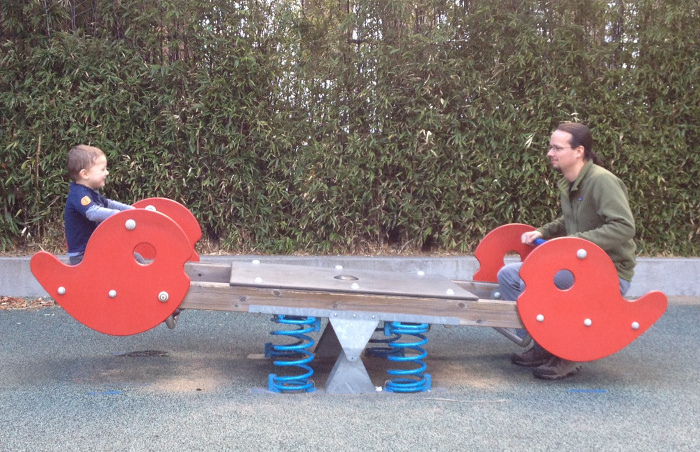 There was also a single-person spinner and a wobbly balance beam to walk on. Away from the main playground area there’s also a digger, fairly close to their sawmill building. Shade The more modern playground is shaded by the trees but the wood-based playground elements don’t appear to get shade. 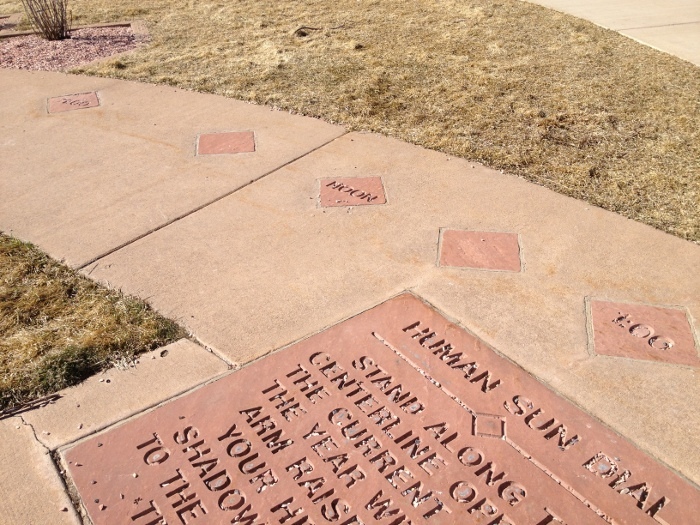 After Salberg Park I decided to drop by Columbine Park which was just a few blocks away. Earlier in the morning when I was trying to decide where to go I stumbled across a Boulder City post about their Top 10 Nature Play Parks. Columbine Park was on the list but I wasn’t sure if it was going to be large enough to amuse Calvin for more than a couple of minutes. 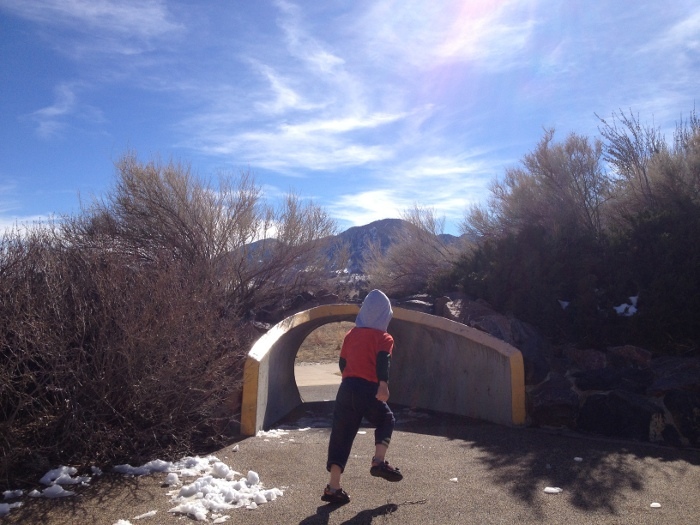 Columbine Park was a very pleasant surprise. 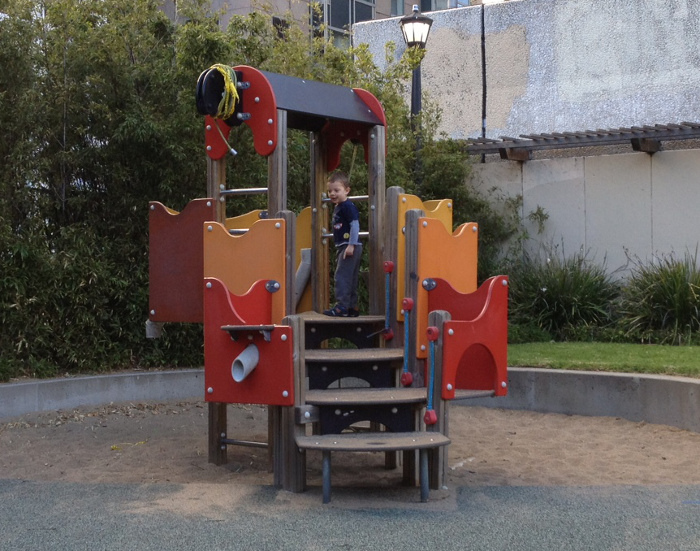 It doesn’t have any traditional playground structures but still had enough elements to keep Calvin amused. 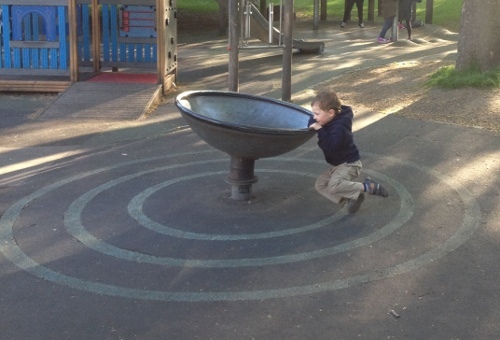 The first thing he did was run over to the “OmniSpin Spinner” which appears to be a modern equivalent of a merry-go-round. It’s definitely a cut above most modern merry-go-rounds but I found it difficult to get up to a nice speed (being pregnant probably doesn’t help). Even though it goes slower, it’s pretty comfortable to sit in. I relaxed in it for a bit and let Calvin (briefly) spin me. Next up, Calvin climbed aboard the “Oodle Swing” (at least, I think it’s an Oodle swing, definitely similar if it’s not that exactly). Add some pillows and I think it’d make a nice hammock-like swing for a kid to read in. 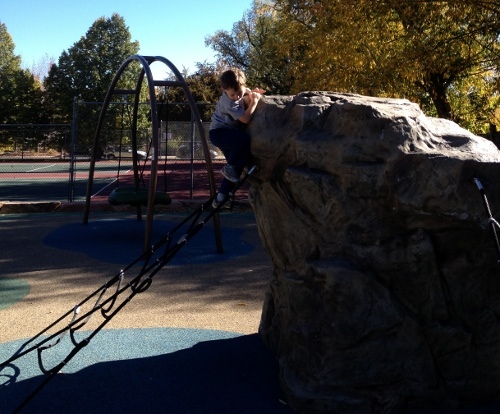 The playground also have several rocks with rope ladders to climb up. A unique feature of this park is its extended balance path consisting of pretend tree stumps, rocks, log balance beams, and log tunnels. Calvin enjoyed running back and forth on them. 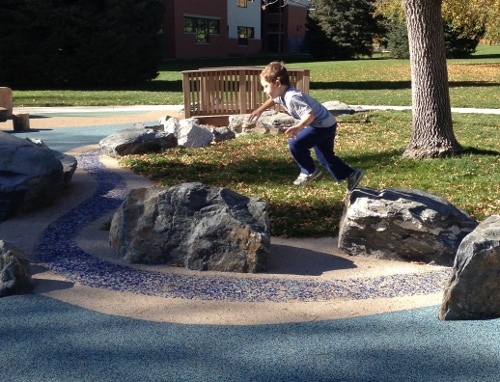 The park also had a fake “stream” wandering around one edge of the playground area with rocks providing more balance options. The final feature of the park is a tree. Normally, I just mention the man-made structures. However, this was a perfect playground tree. Its branches hang low enough to the ground that children ducking under toward the trunk are nicely hidden. 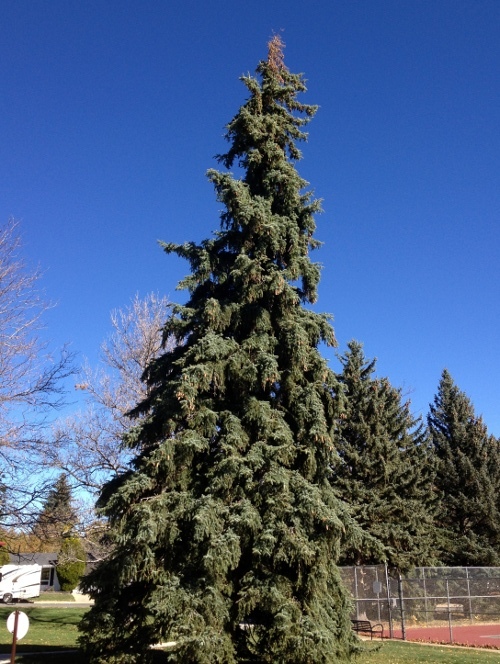 Plus, the branches are low enough to the ground that children can climb up the (sap-leaking) tree. This is probably not an officially approved activity but I liked Calvin have the opportunity to climb on something actually natural, not just nature-imitating. Calvin didn’t go up more than a couple of branches but enjoyed that bit of climbing up by himself. I was amused to see a sign indicating the playground was designed for ages 5-12. I know they have to do this for safety reasons but there was a lot that younger kids could get from this park. I think it’s one we might go back and visit once 2.1 is born. Shade Yes, there’s quite a bit of shade provided by a picnic structure and mature trees. Picnic area Yes, one covered picnic area with a couple of tables, including wheelchair friendly tables. 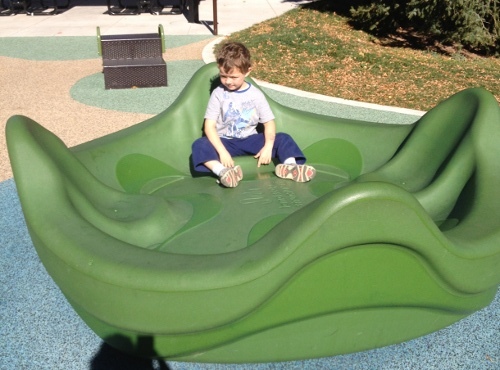 No traditional playground equipment, may bore some kids? 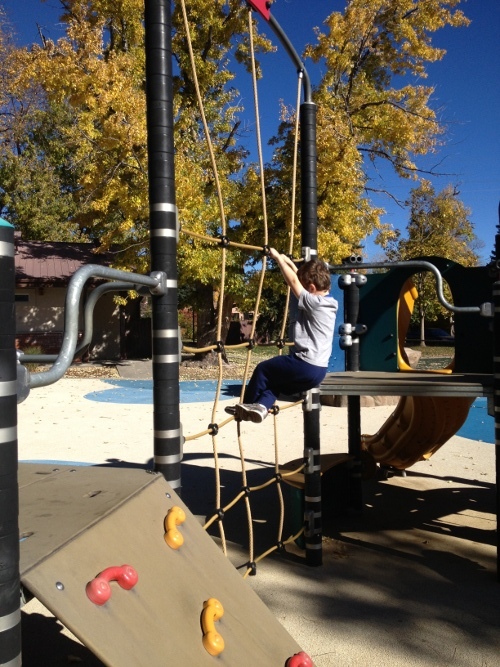 This entry was posted in Calvin, Parks and Playgrounds on October 25, 2014 by kiesa. October has been unnaturally warm. It’s almost the end of October and today was sunny and almost 80 degrees. On the weekends Calvin has a tendency to get stuck in the family room playing with Legos all day. I love Legos but I also think that outside time is important. So I decided it was time to go and explore a couple of parks. 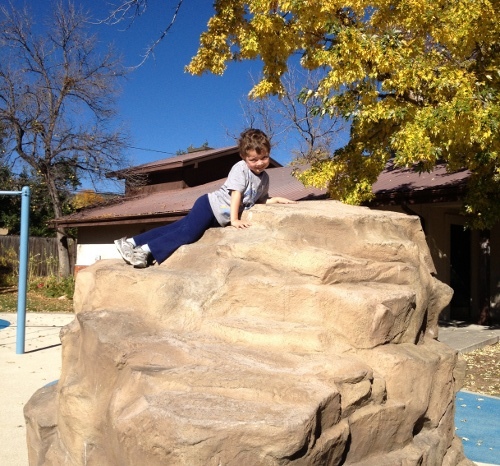 We first went to Salberg Park. Calvin and I have been to this park before but it was in the pre-photographing of park era. It’s a nice park with restrooms! (Though it appears the restrooms may only be open in summer as they were locked today). 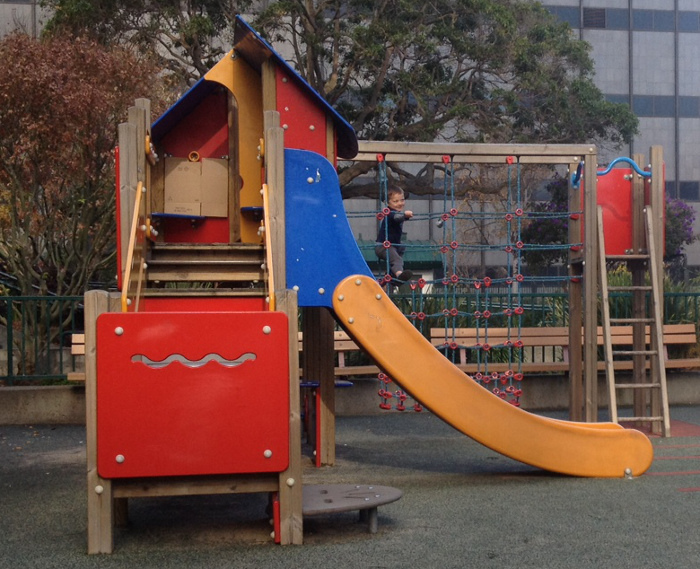 The park has a nice-sized traditional playground structure. 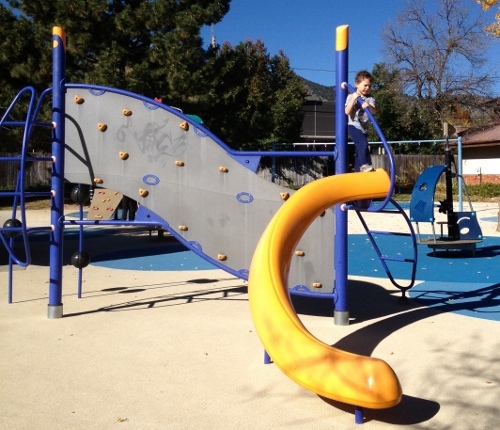 It’s mainly designed for “older” kids but does have several things underneath for younger kids. An example is a little bucket swing. Calvin enjoyed climbing across the rope wall. 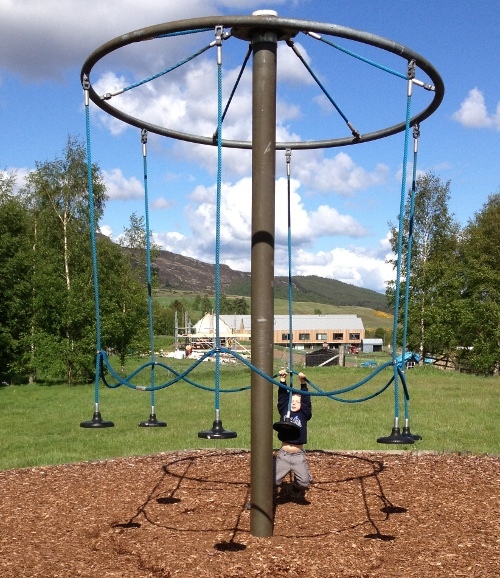 The playground also has two regular swings and two bucket swings for babies. (Calvin hasn’t learned how to swing himself yet so I don’t have any pictures of them). I had forgotten that Salberg park has a very nice sand area. I should have brought our sand toys. 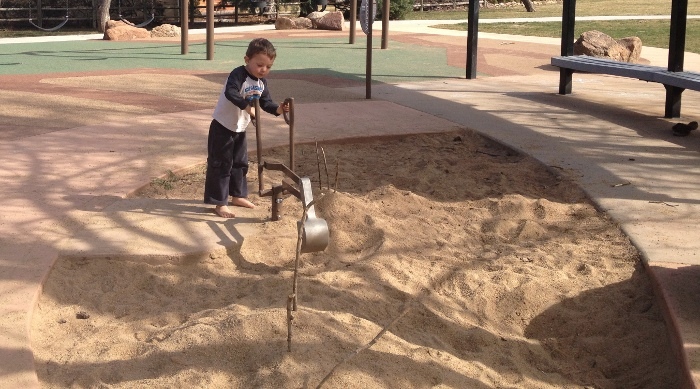 Even so, Calvin was able to amuse himself with the built-in sand equipment: two regular diggers, a wheelchair accessible digger, and an elevated sand table. As always, Calvin enjoys climbing on the rocks. 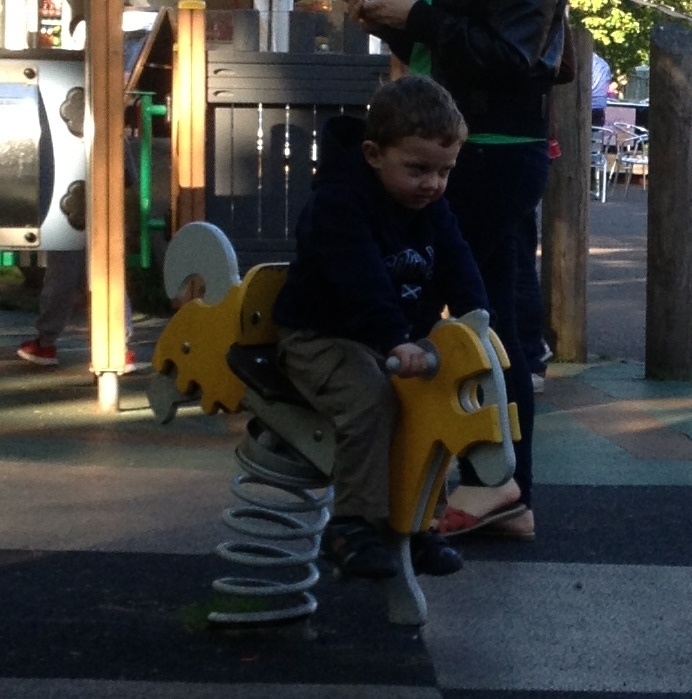 I think the playground might have been upgraded since I was there last. It has two structures that I don’t remember. The first is some equipment that I believe is suppose to mimic a sailboat (note it’s also surrounded by blue poured rubber). The entire structure can be rotated, with some effort. 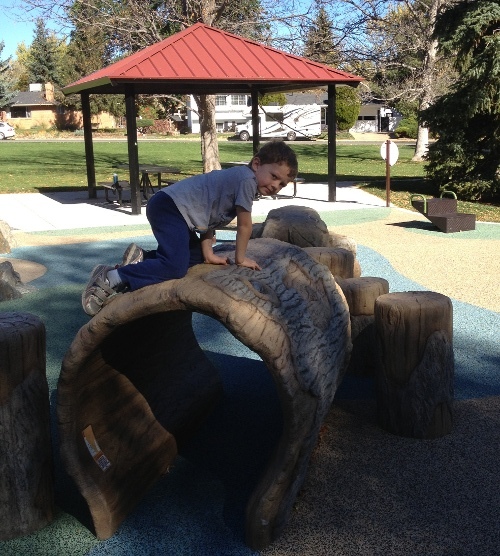 The other structure provides more climbing opportunities. Picnic area Yes, one covered picnic area and additional nearby picnic tables. 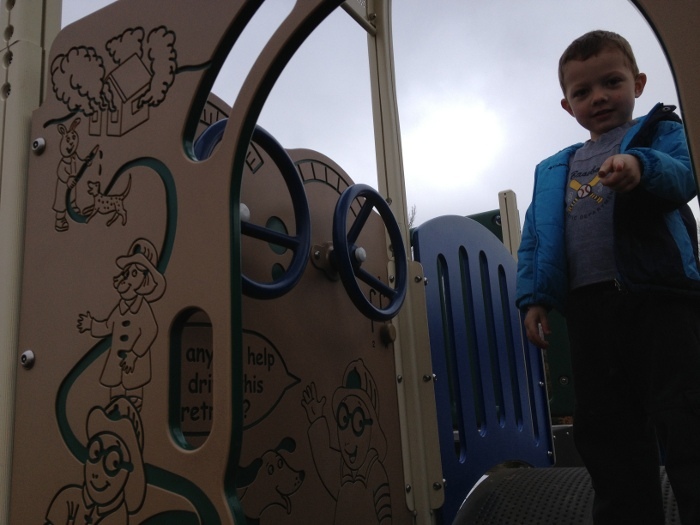 Several weeks ago Calvin and I made it to another park. However, then life got busy and I never got around to posting about it. 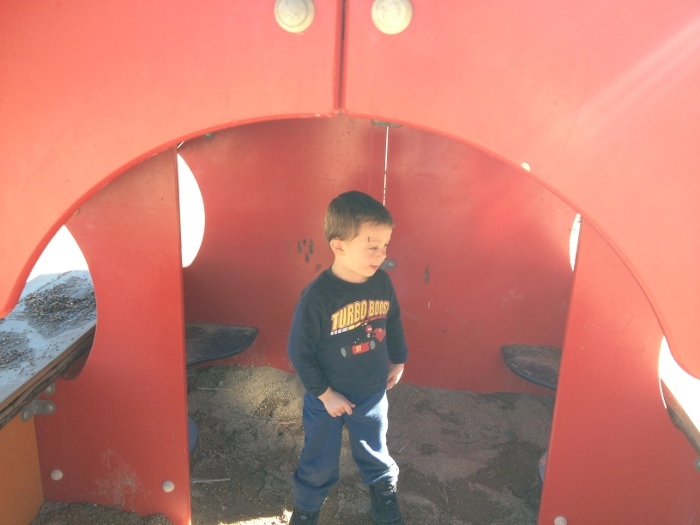 We visited Pineview Park which is relatively close to his preschool. 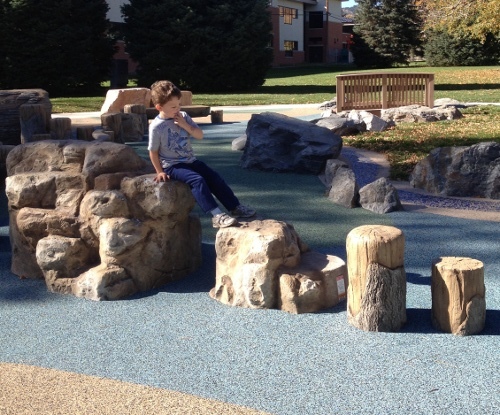 It’s a nice playground with a “nature” theme that was just remodeled in 2013. It even has sand! 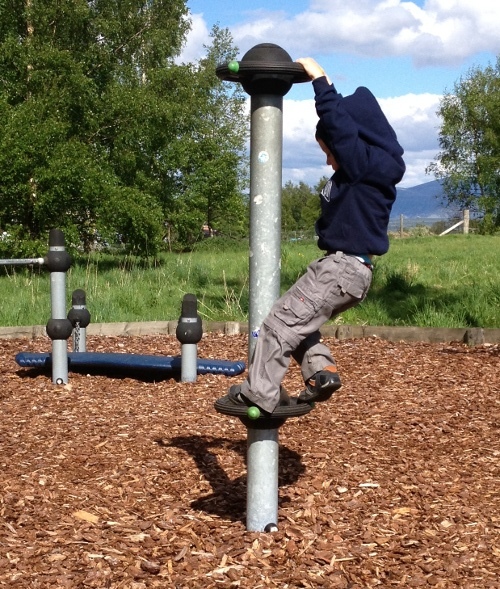 The playground structure itself has a lot of different climbing options. Calvin ventured out on the rock but didn’t want to try climbing down that way. 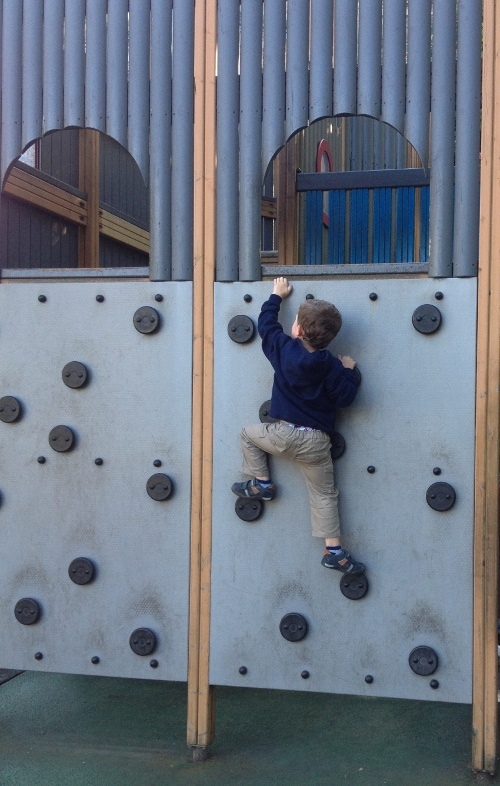 He did venture up the petite climbing wall though. 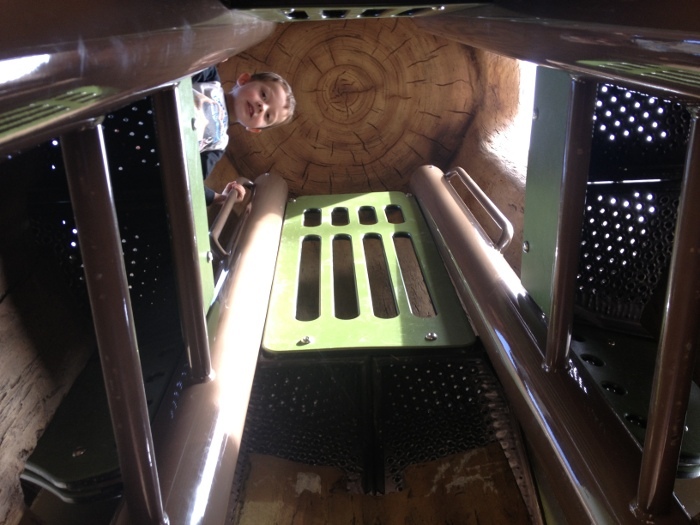 An interesting feature is the “tree trunk” was created to be hollow to allow climbing ladders up and down. 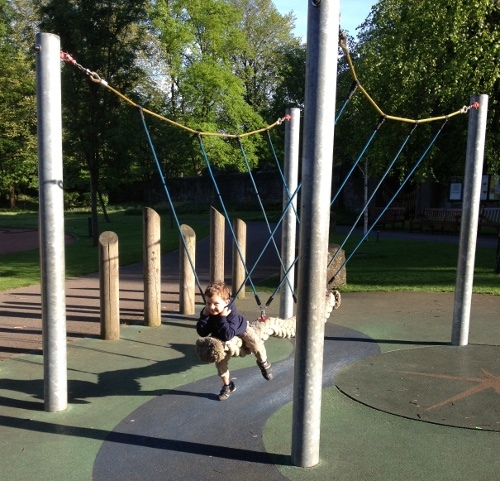 The park also has a nice covered area for parents to sit on and both regular and bucket swings. As an aside, the Boulder park website claims there are restrooms, a water fountain, and a parking garage which is incorrect I assume that must be a copy/paste job from another park. 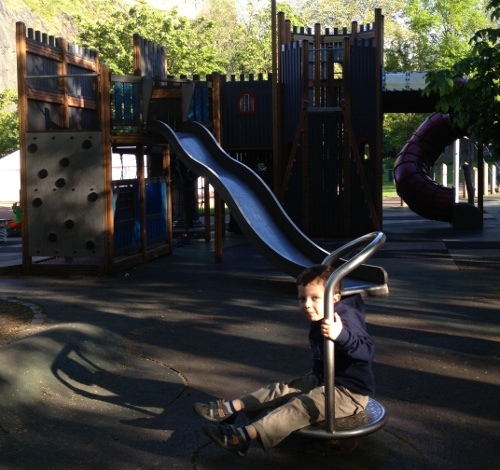 All-in-all, it’s a cute park and is close enough to Calvin’s preschool we might visit it again. 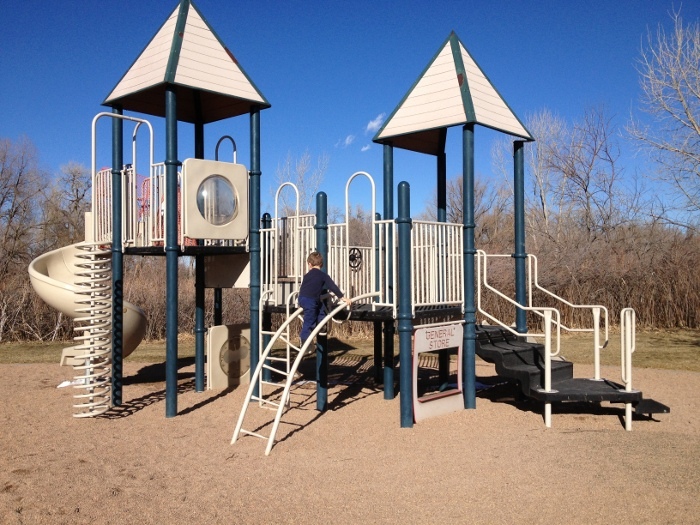 This entry was posted in Calvin, Parks and Playgrounds on April 5, 2014 by kiesa. The weather was marvelous today. I spent the morning working on money but after lunch Calvin and I went thrift store shopping and then stopped by Boulder’s southernmost park, Shanahan Ridge Park. 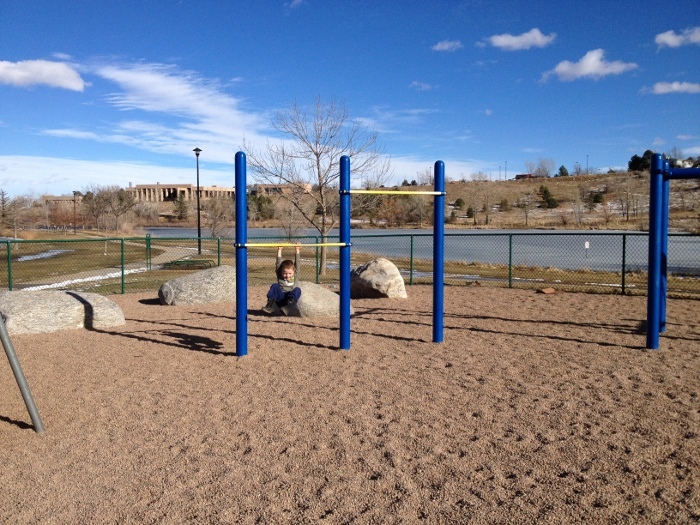 The Shanahan Park Page, on Boulder’s site, said the park was “small” but I didn’t understand how small till we got there. The picture below shows you most of the park. Parking turned out to be quite tricky. In addition, Google maps took me a couple blocks past the park and into an apartment complex. I followed Google’s directions hoping it knew about a parking lot I didn’t but, alas, it was just confused. I backtracked and decided the road next to the park was too narrow to park on the street. Eventually, I parked on Smuggler Way which had a path to the park. As I stated above, the park is really small. 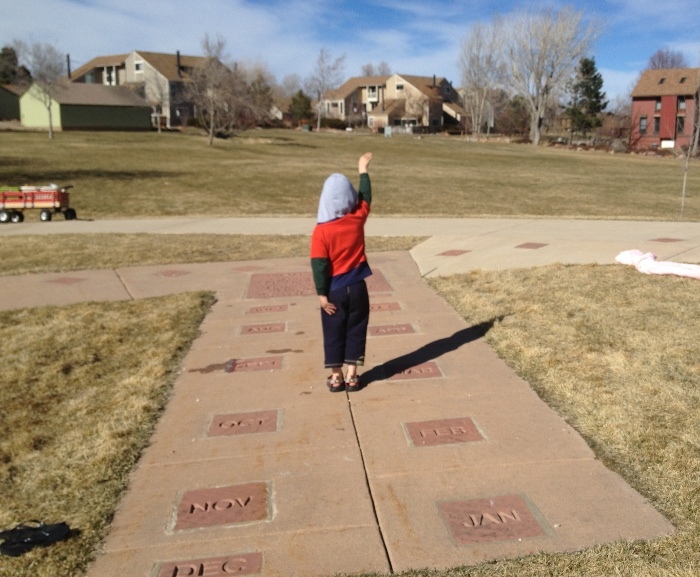 However, it did have a very unusual feature: a human sundial1. I had Calvin try it out but I think a taller person would have worked better. It seemed roughly accurate, within an hour or so2. The sundial amused me a lot more than Calvin. 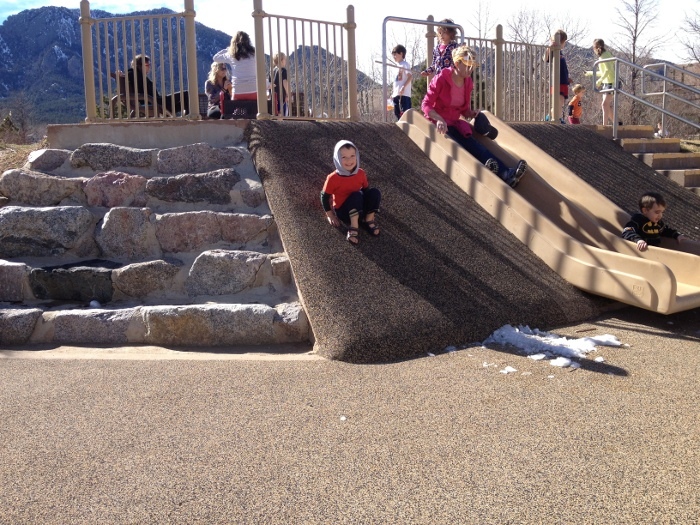 However, even though the park is really small Calvin had a blast running up and down the slide area. When I looked at the city’s picture of the park, I thought the slide had asphalt on either side but it turned out to be poured rubber. They also had a random hole that kids could run through. 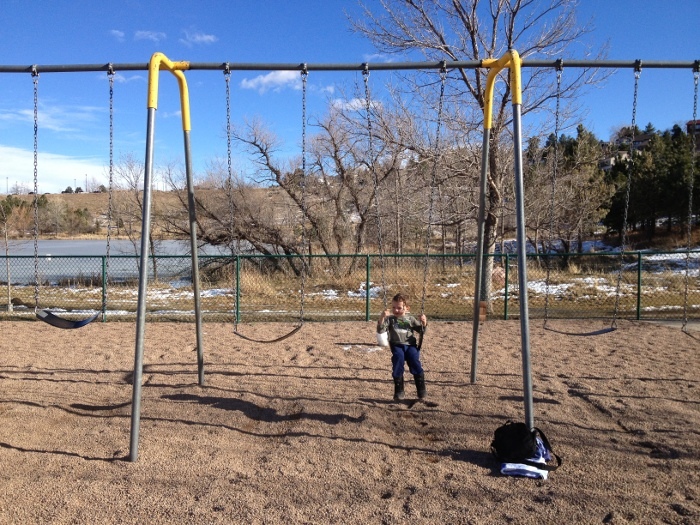 Lastly, the park did have two regular swings and one bucket swing. 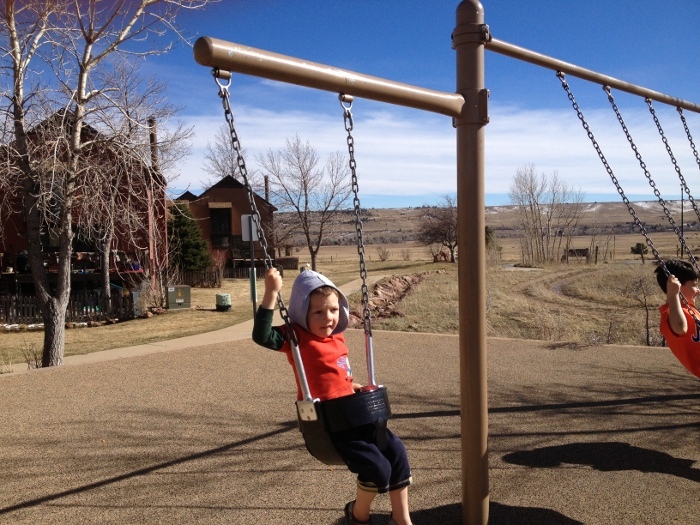 Even though the park is small, it was completely overrun with kids so Calvin had to make do with the bucket swing. It was a really interesting park to visit. The parking’s horrible but it was a fun visit. Parking Horrible parking options. Try parking on Smuggler Way and then walking. Seems very popular with kids. 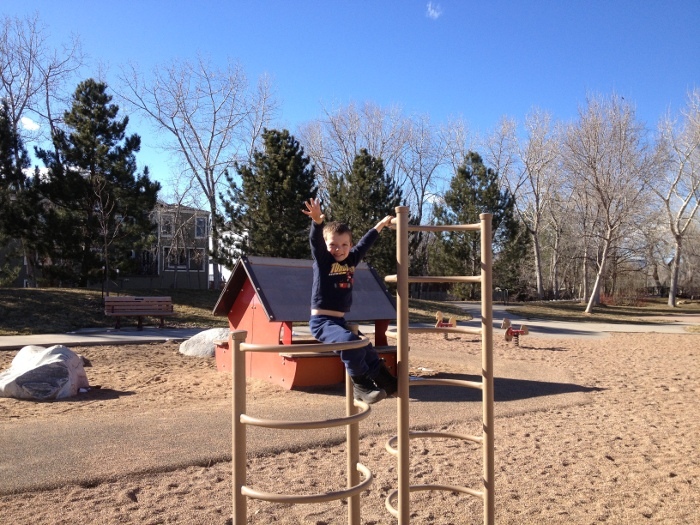 This entry was posted in Calvin, Parks and Playgrounds on March 9, 2014 by kiesa. I signed Calvin to participate in a study on Monday at the Cognitive Development Center but we had about an hour after preschool before we needed to be there. 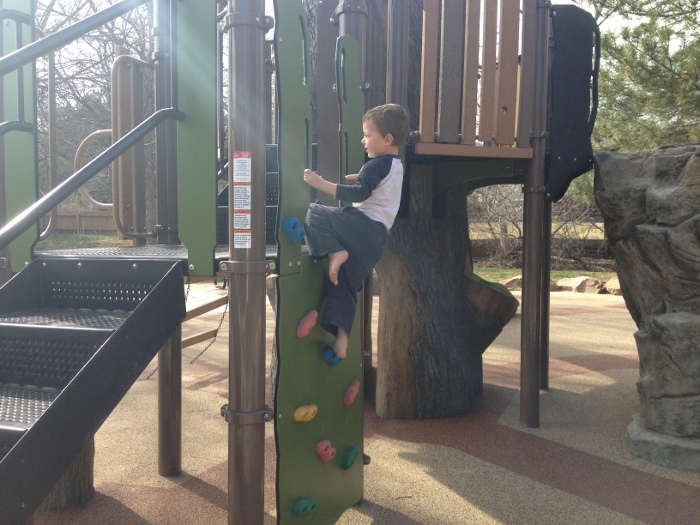 Monday turned out to be remarkably warm, for winter, so I decided we should visit a park first. 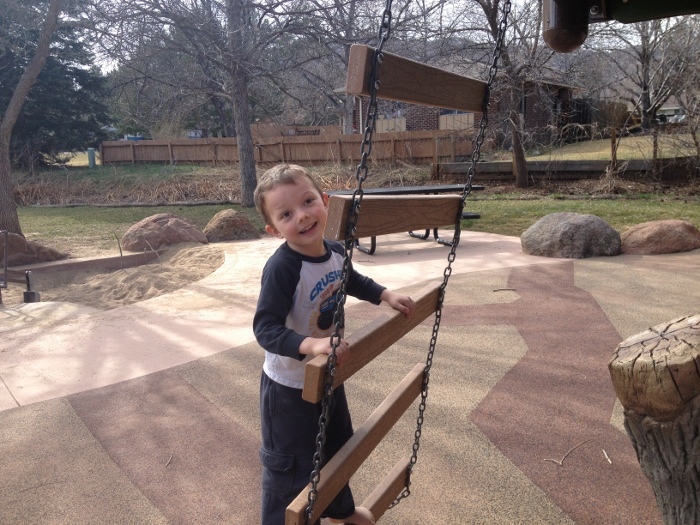 I went to City of Boulder’s playground list and decided to try out Meadow Glen Park. In the picture above, you’ll also see there’s a red playhouse-type structure. I’m not sure what it is suppose to be called officially. It’s bigger than the normal playground playhouses. Outside, along either side, there’s a bench that can be sat on. Inside, there’s a fair amount of space and a couple small seats that kids can perch on. 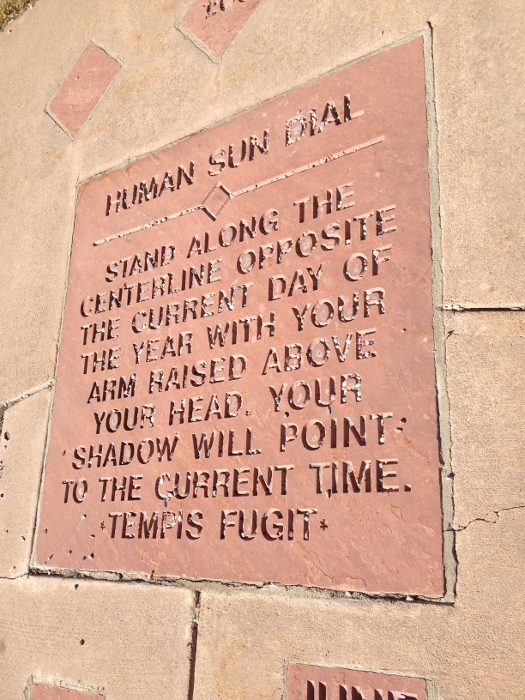 One of the other unique features of this park is it has a sun dial. It seemed accurate to within a 1/2 hr or so. 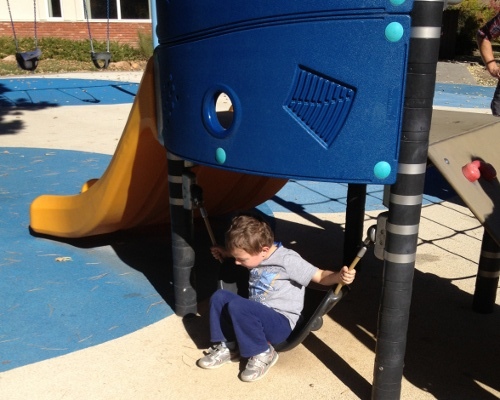 The playground also feature several swings and traditional-style playground equipment. Unfortunately, the spiral slide was roped off with a note that it needed to be fixed. 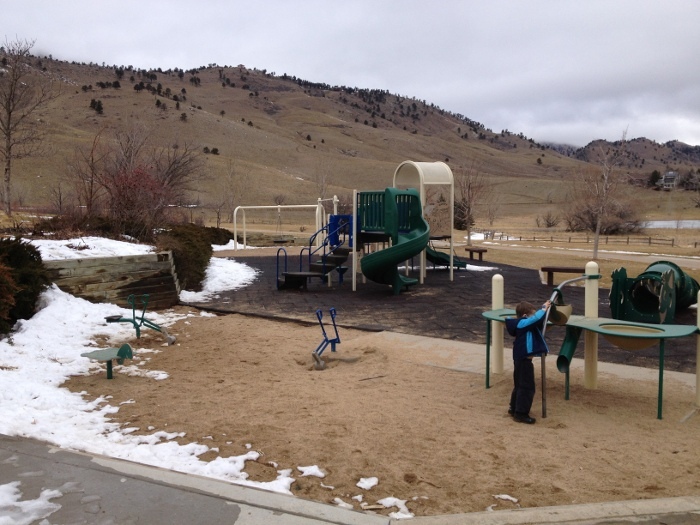 The park backs up to City of Boulder open space on two sides. It’s not as scenic as Foothills Community Park but is still very relaxing. In addition to playground equipment there’s a small basketball court and the park connects to a path that runs beside the Empson Ditch. 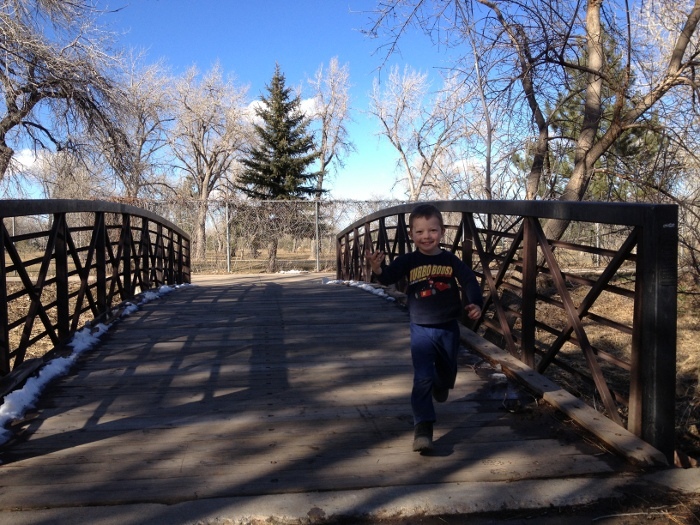 Once Calvin got bored with the playground he challenged me to several “races” across the bridge that spans the ditch. I don’t think we’ll go back to this park, we still have a lot of parks left to explore. However, it did provide a nice break in the day. Surface Material Mostly pea gravel. Some poured rubber. Shade Most of the playground is unshaded. Playhouse provides shade as do some mature trees on the west side. 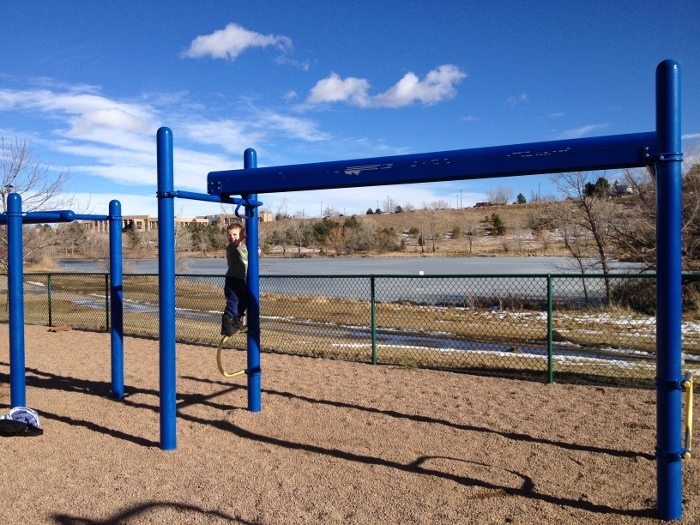 This entry was posted in Calvin, Parks and Playgrounds on March 8, 2014 by kiesa. Well . . . the weather report misled us. It said today was suppose to be sunny and 60 degrees. It actually was cloudy and in the 30s with a couple snowflakes drifting down. 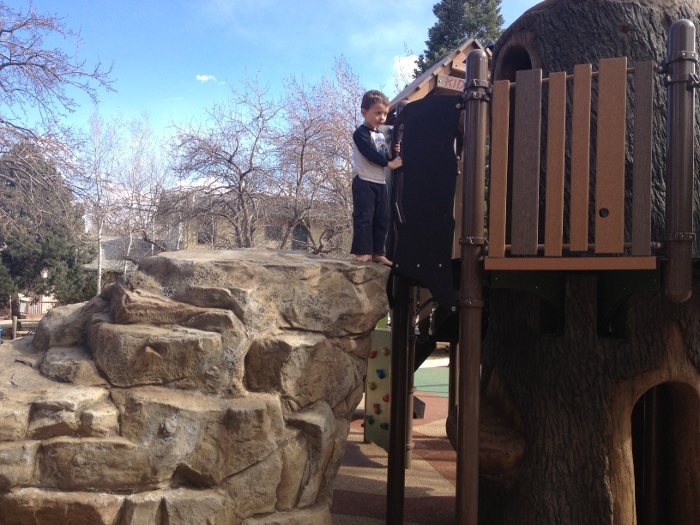 However, I told Calvin we would go to a park today so we went to the park after Sabbath School. This time we went to Wonderland Lake Park which was almost on the way home. Getting there turned out to be more confusing than I expected. I had looked briefly at the map but my phone’s battery was dying and I wanted to save it for pictures so I didn’t use it for directions. I missed the turn the first time but eventually figured out that from Broadway I needed to turn west onto Poplar. It’s a “neighborhood” park which I think means there is no parking lot. We parked on Poplar street between Quince Cir and Quail Cir. The park itself is beautifully situated. Wonderlake is fairly close and there are hills in the background. There’s a nice sand area with an elevated sand table and two diggers. One digger has a seat and the other one doesn’t so it can be used standing up or by someone in a wheelchair. 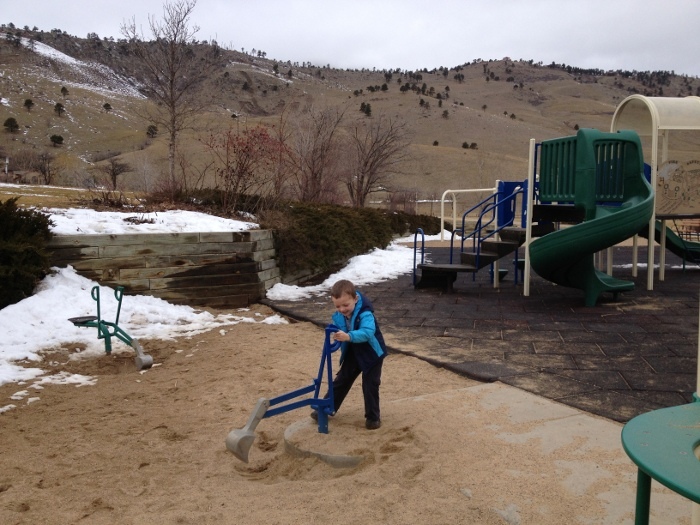 Unfortunately, the snow had melted into the sand and frozen it into one hard mass so it was hard to do much digging. 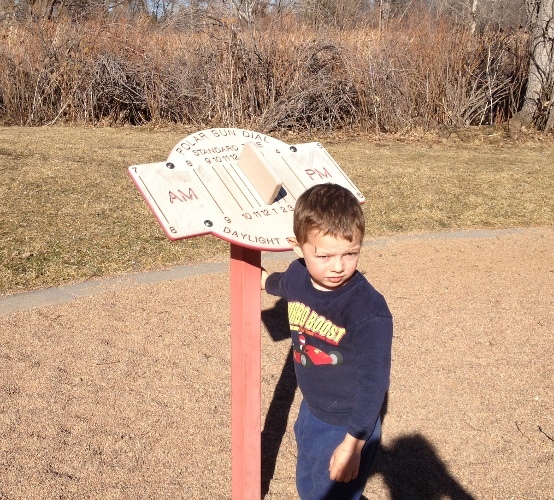 An informational sign at the park says the park was designed for ages 2-5. Though, most of the equipment seemed a bit “old” to officially be for 2-5 year olds. 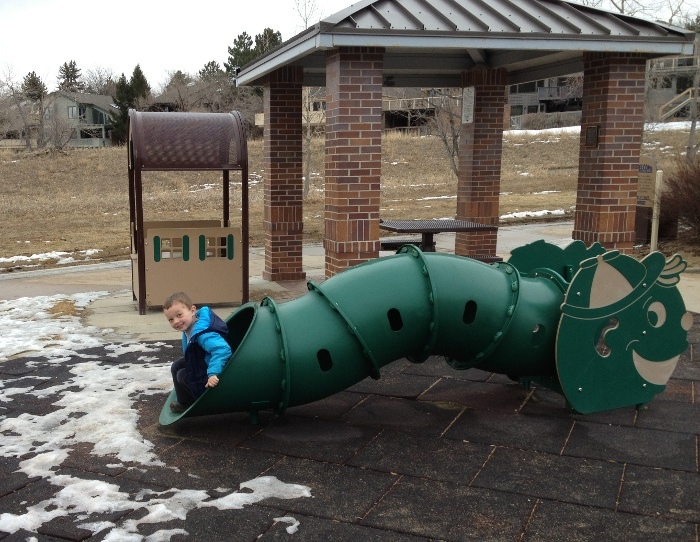 However, they did have an interesting caterpillar tunnel as well as a little covered house. 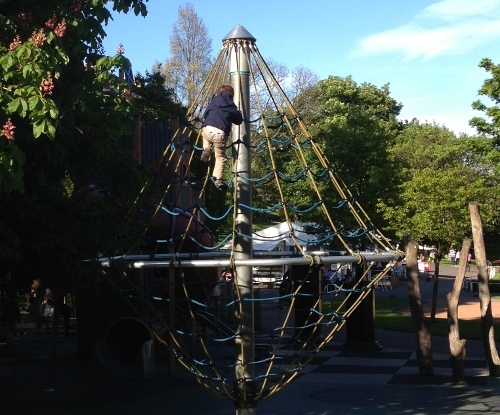 The main play structure is probably officially rated for 5-12 year olds but probably interests younger kids more. It’s a traditional style but looks fairly new. One of the panels was a double steering wheel. They also had a periscope panel and Calvin pretended he was on a submarine. 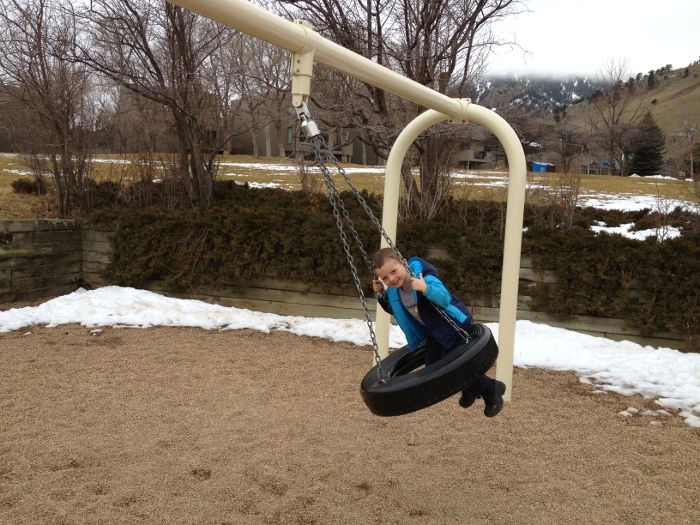 Like Harlow Platts Park, they had a tire swing. I was expecting I would have to push him a lot. 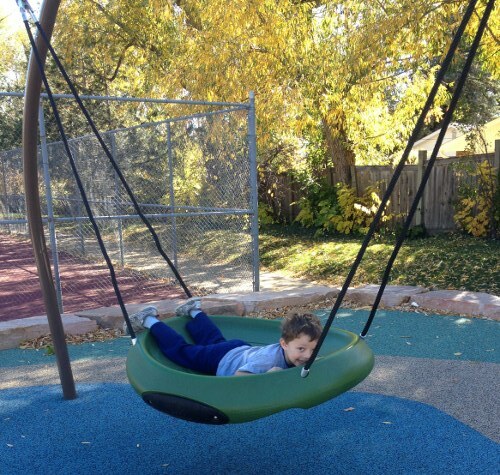 However, after the picture below, when the tire swing was practically motionless, Calvin fell off, bumped his head and didn’t want to get on after that. I’m not sure how he fell off, I was zipping my coat up and missed it. 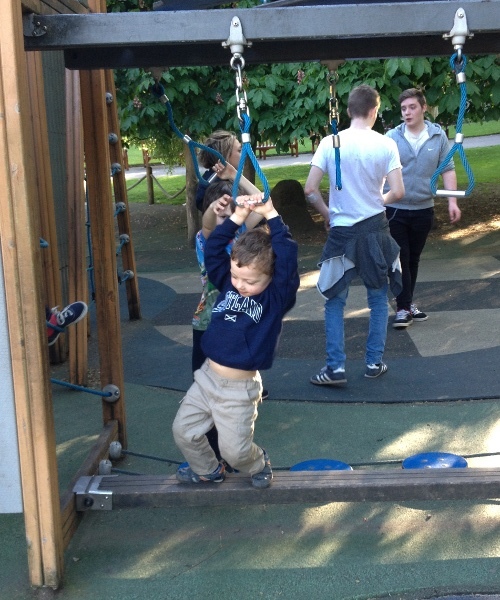 However, it seems weird he fell off this swing when I was spinning him very fast on the other without any problems. Perhaps he got overconfident. We didn’t stay very long at this park. It’s a nice park but the weather was chilly. However, before we left Calvin managed to make some sand dunes (plural, he got upset when it was implied it was only one sand dune). If you look closely at the picture you’ll see a rock on top. That is Calvin. Next to it is a stick. That is Jaeger. Surface Material Mostly rubber squares. Sand in the sand area and pea gravel by the tire swing. Shade Small shaded structure with a picic table. 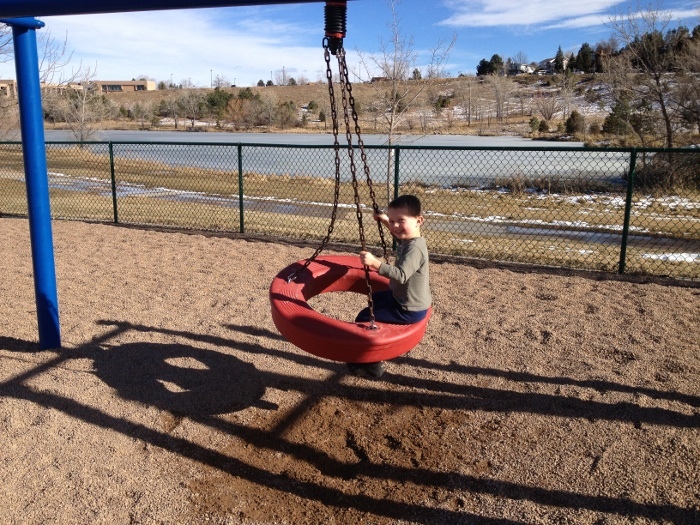 This entry was posted in Calvin, Parks and Playgrounds on February 15, 2014 by kiesa. The past couple of weeks have been fairly snowy and cold. However, today’s weather was forecasted to be in the 50s and I decided we needed to take advantage of the weather and go to a park. 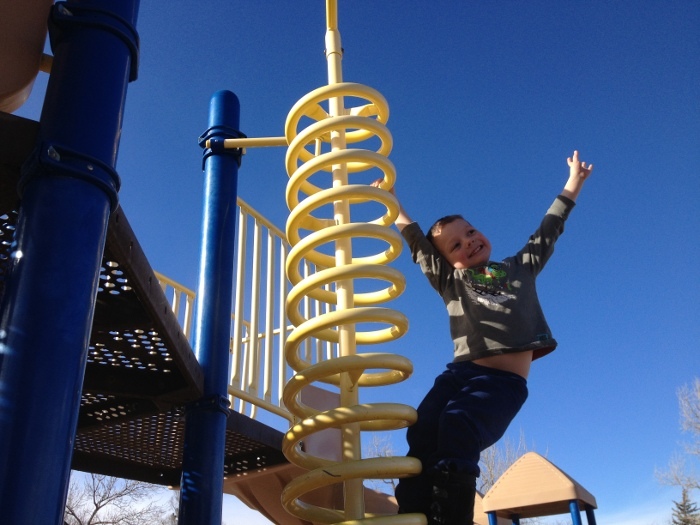 After speech therapy, I took Calvin to Harlow Platts Community Park which is very close to Fairview, the high school Jaeger went to. This morning our backyard still had several inches of snow so I brought along a towel in case I needed to wipe off the slides. Viele Lake, adjacent to the park, was covered in ice. 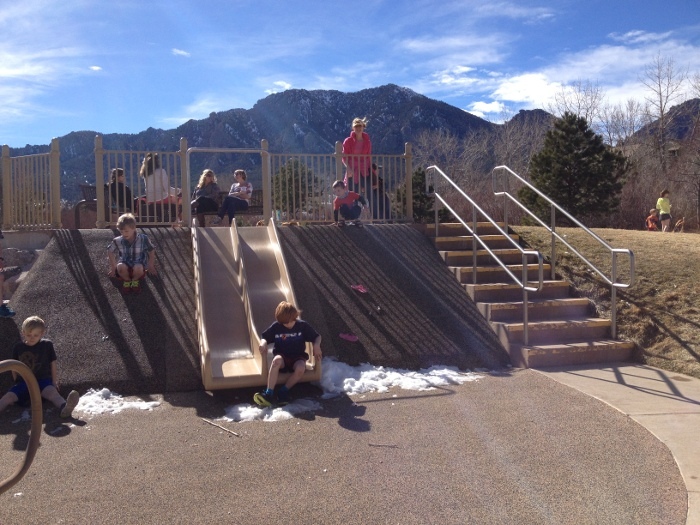 However, the playground itself was completely snow free and the slides were even dry! 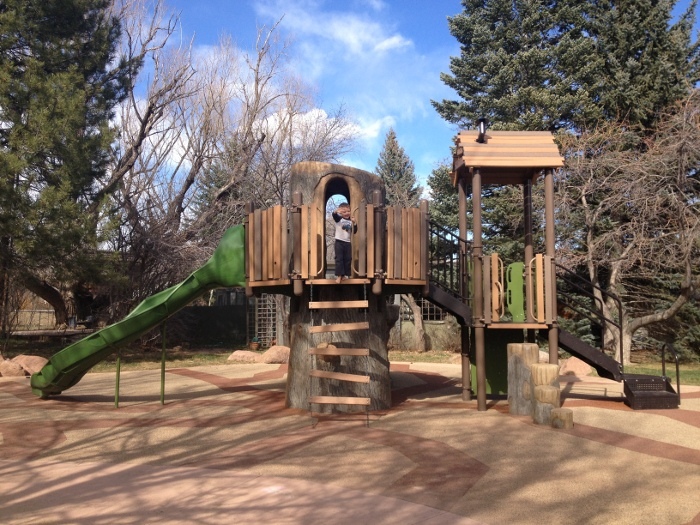 The park also had a traditional play structure which the safety experts will tell us is for kids ages 5-12. 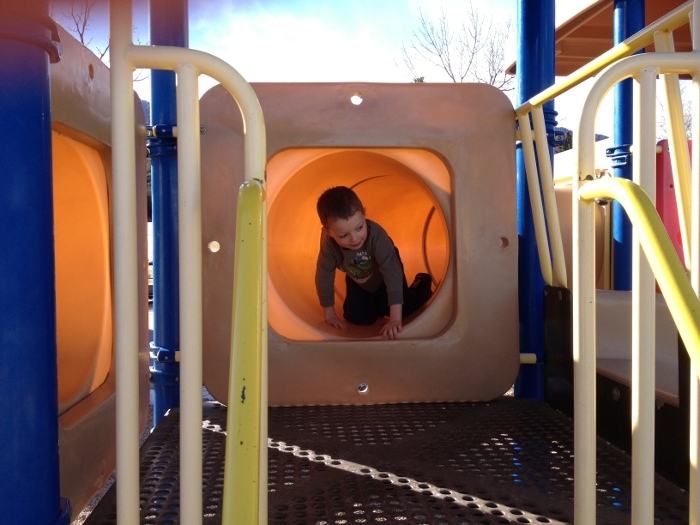 Calvin climbed up the corkscrew and slid down the covered slide once but other than that ignored it. 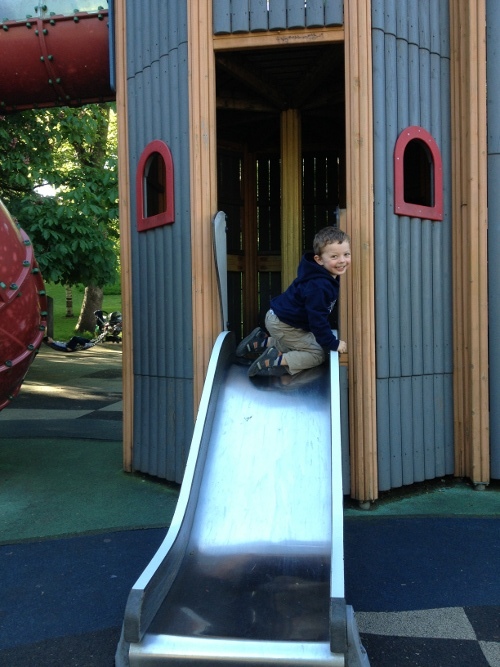 They also had a play structure for 2-5 year olds. Calvin wandered around this a bit more because it was windy and this structure was sheltered better. The tunnel made a nice escape from the wind. Calvin tried the overhead glider but it’s still a bit tall for him. I lifted him up and pushed him to the other side but it was too awkward for him to really enjoy it. 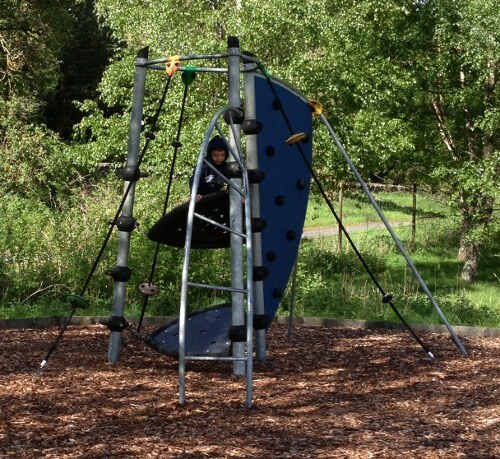 The park has both bucket swings for smaller children and decent sized swings for older kids. However, Calvin didn’t stay on them long because it was uncomfortable with the blowing wind. Calvin did enjoy playing a little bit with the pull-up bar. There was also a decently sized sand pit which looks like it could be interesting closer to summer. 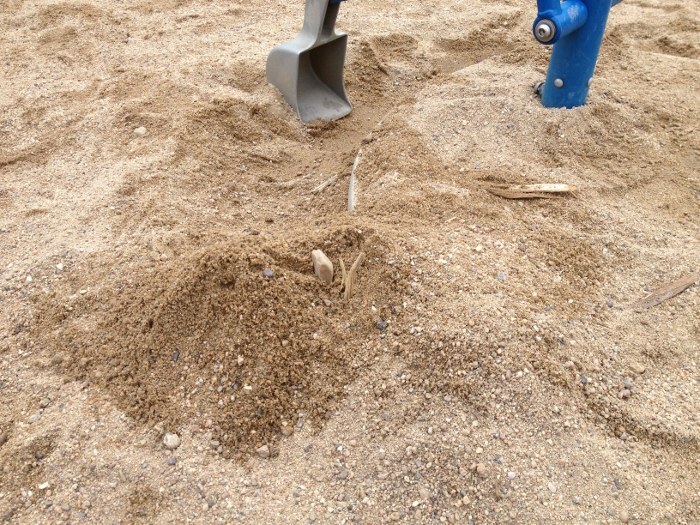 There’s no provided sand toys but it’s a big enough area he could bring his shovel and bucket and spread out a bit. Overall, this was an ok park. I expected more from it since it’s close to the recreation center but it didn’t really overwhelm me. It looks like there are some nice paths around the lake that might be nice for Calvin to ride his bike around. Shade Shaded structure right next to the playground but the equipment itself isn’t shaded. The lake is picturesque but there’s a fence between it and the playground to keep toddlers from wandering too far. The tire swing was nice but other than that it wasn’t a particularly exciting park. 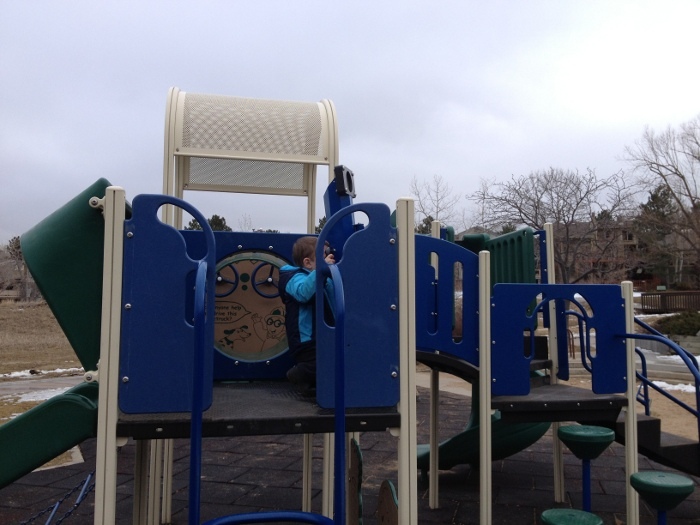 This entry was posted in Calvin, Parks and Playgrounds on February 13, 2014 by kiesa. The last couple of weeks have been busy. Calvin and I went out to visit Nana, Jaeger’s mother, early so she could have more time with Calvin. Than the rest of the family arrived a couple of days later. After Christmas we flew to San Francisco and are decompressing from family time before going to visit Jaeger’s grandmother. This was our second full day in San Francisco. We went to Chinatown and wandered around the streets for a while. 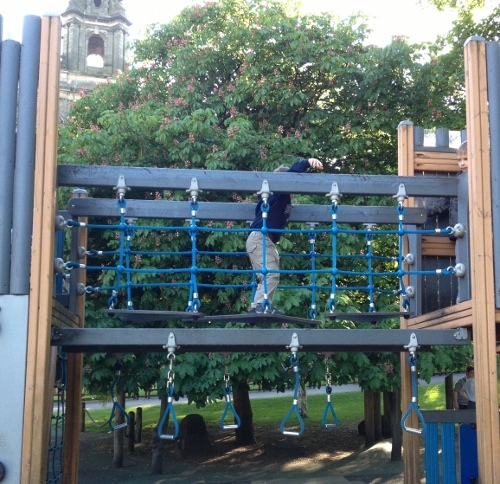 While there, we stumbled across a playground in St. Mary’s Square1. To my surprise it was mostly deserted . Maybe it was just the wrong time of day for families to be their with their children. 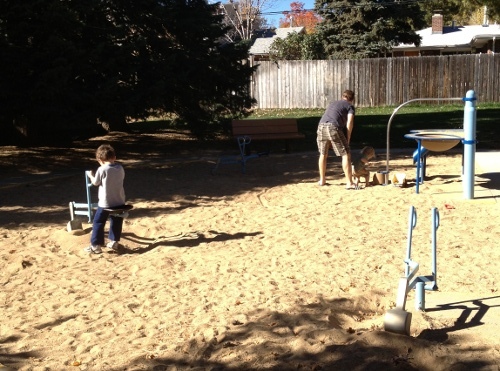 The playground is small but has a nice selection of equipment. The equipment seems fairly new but is showing some sign of wear and tear. The first thing Calvin tried out was the double teeter-totter-type thing. 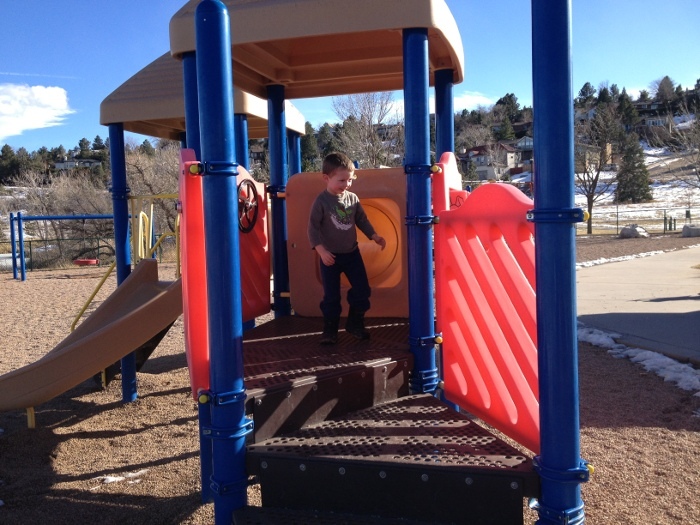 Next, he played for a bit with the Playworks structure which was very similar to the one at East Boulder Community Park. 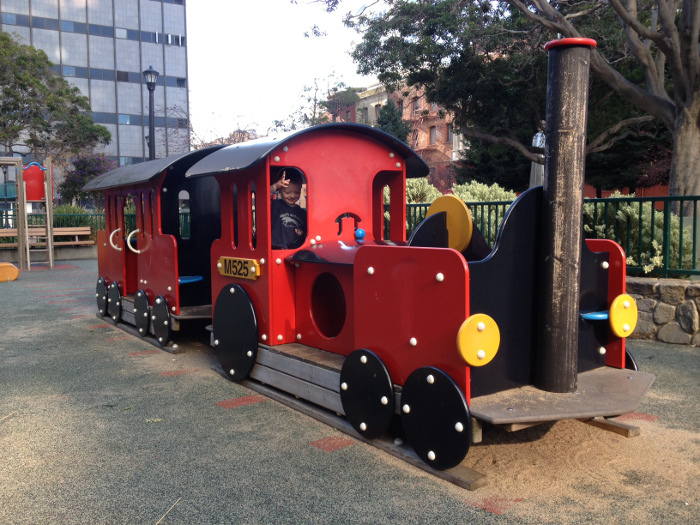 They also had a train which looked like it could entertain a variety of ages. The last piece of equipment was a semi-traditional playground set that is probably officially designed for 5-12 year-olds. Calvin enjoyed climbing on the rope ladder but other than that seemed to get bored of it fairly quickly. They also had some swings outside the fenced area but we didn’t get around to those. It was a nice little park and provided a great opportunity for Calvin to run around and get energy out before once again braving the Chinatown crowds. Shade Yes, mainly provided by the tall buildings around the park. Parking I believe it’s on top of a parking garage but we walked there. Eqipment showing some wear and tear, though most is still fine. It’s a city so there’s homeless people, though none were near the enclosed part of the playground. 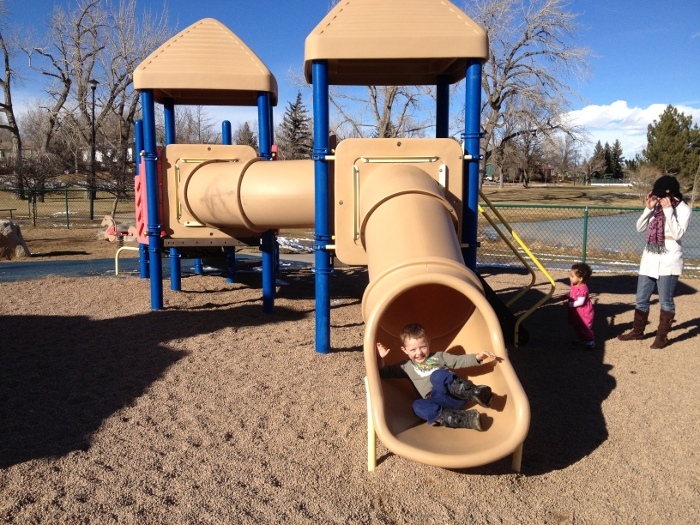 This entry was posted in Calvin, Parks and Playgrounds, Trips on December 28, 2013 by kiesa.